Prof. Dr. Raheel Qamar (T.I or Tamgha-i-Imtiaz) is the Rector of the COMSATS Institute of Information Technology (CIIT), Islamabad. CIIT is the Pakistan’s first exclusive institute for Information Technology. The CIIT was awarded Charter by the Government of Pakistan in the year 2000 and in less than a decade, it has grown into a quality institution of higher learning under his able leadership. CIIT now has eight campuses in seven cities, a student population of more than 35,000 and faculty base of 2,887. In addition to Information Technology, the Institute offers several bachelor, master and doctoral programs in engineering, basic sciences, management sciences and architecture. Previously, Prof. Dr. Raheel Qamar served as a Tenured Professor of Biochemistry & Molecular Biology at the Department of Biosciences and the Dean of Research Innovation & Commercialization, CIIT. His research interests include searching for the genetic causes of inherited diseases. He has published extensively in ophthalmogenetics and population genetics. He has several international collaborations including with the Radboud University, McGill etc. With the former he has initiated a joint degree program for PhD students. Professor Dr. Raheel Qamar (T.I), is also the recipient of prestigious national award ‘Tamgha-i-Imtiaz’ (Medal of Excellence). It is the fourth highest civilian award given for outstanding achievements, in Pakistan. On August 14, 2007, the government of Pakistan conferred the prestigious award upon Prof. Dr. Raheel Qamar. The investiture ceremony took place at Governor House, Peshawar on Pakistan Resolution Day /Republic Day on March 23, 2008. Besides this, he also received various academic grants for pursuing research in Bio Sciences. He has served at key positions in various national and international organization. His professional career commenced after obtaining an M.Sc. in Biochemistry from the University of Peshawar, he worked as a Scientific Officer at the National Institute of Health, Islamabad, Pakistan. He then proceeded to USA to work towards his Ph.D. in the Department of Biochemistry Molecular Biology, University of North Texas, Denton, Texas, USA. During his stay in the US, he worked as a Research Assistant at the Department of Biochemistry, University of North Texas and as a Research Associate at the Department of Microbiology & Immunology, Texas College of Osteopathic Medicine, Fort Worth, Texas, USA. After completing my Ph.D. He came back to Pakistan and joined Dr. A. Q. Khan Research Laboratories as a Senior Scientific Officer and was subsequently promoted to the position of Principal Scientific Officer. From 1998 to 2001, He worked for a while with Dr. Chris Tyler-Smith at the Department of Biochemistry, University of Oxford, Oxford, UK in the lab of Prof. E.M. Southern. In 2002, he joined Shifa College of Medicine as Assistant Professor of Biochemistry and in 2003 was promoted to the post of Associate Professor & also appointed as the Director of PCR Labs. 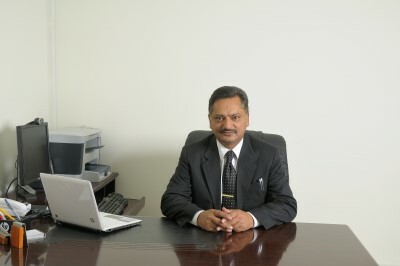 In 2004, he was appointed as the Research Director of Shifa College of Medicine. In 2005, he joined COMSATS Institute of Information Technology as Professor of Biosciences and served as the Chair of the Department of Biosciences till 2008 when he was appointed as the Dean of the Faculty of Sciences. Meanwhile, he is continuing to serve as the Research & PCR Lab Director at the Shifa College of Medicine. His training has been in Chemical pathology, Biochemistry, Biomedical & Genetic Engineering. He has completed courses in DNA Cloning & Sequencing from the University of Portsmouth, Portsmouth, United Kingdom. In Polymerase Chain Reaction (PCR) Applications from the American Type Culture Collection (ATCC), Rockville, Maryland, USA., a course in operation of the DNA sequencer Model 377 from Applied Biosystems, A Division of Perkin Elmer American, at the Foster City, USA and a fourth course in DNA Sequencer Training from the Beckman center, High wycombe, UK. His research specialization includes Enzymology, Population & Molecular Genetics and Molecular Pathology. He is particularly interested in searching for the molecular basis of all forms of inherited diseases in the Pakistani populations and his research group, comprising of 4 PhD, 5 MS students, 4 Assistant Professors and 3 Foreign Professors, is currently working on several different projects along these lines. 2011-2013: “Genetic Analysis of Recessive Retinitis Pigmentosa in Pakistani Population”. Rs. 1.99 Million under the Pakistan Academy of Sciences (PAS) Research Grant Award as Principal Investigator or PI, grant no. PAS/I-9/Project. 2011-2013: “Assessment of Genetic Risk Factors of Glaucoma”. Rs. 1.32 Million under the Pakistan Science Foundation (PSF) Grant Award as PI, grant no. PSF/RES/C-COMSATS/MED(280). 2009-2010: “Genetic Studies of Inherited Disorders”. Rs. 1.0 Million Core Grant from the Shifa College of Medicine as PI. 2007-2010: “The Molecular Basis of High Blood Cholesterol in Select Families”. Rs. 5.21 Million under the Higher Education Commission (HEC) National Research Program for Universities (NRPU) Grant Award as PI, grant no. 934. 2006-2009: “Mapping the Genes Responsible for Autosomal Recessive Retinitis Pigmentosa”. Rs. 5.964 Million under the Higher Education Commission (HEC) National Research Program for Universities (NRPU) Grant Award as PI, grant no. 530. 2006-2006: “Strengthening of Molecular Genetics Laboratory of Biosciences CIIT Islamabad”. Rs. 0.677 Million under the HEC Lab Up-gradation Grant Award as PI. 2004-2006: “Association of Tissue Plasminogen Activator and Plasminogen Activator Inhibitor-1 Gene Polymorphisms with Myocardial Infarction”. Rs. 0.221 Million under the Shifa College of Medicine Research Grant Award as PI. 2004-2005: “Genetic Basis of PCOS”. Rs. 0.404 Million under the Shifa College of Medicine Research Grant Award as PI. 2008: Tamgha-i-Imtiaz by the President of Islamic Republic of Pakistan. 1998-2001: Wellcome Trust Fellowship, UK. 1987-1988: Robert A. Welch Foundation, USA, Fellowship for PhD studies.